Circus Carousel Girl,Huacaya Female, DRG, ARI: 30914568, DOB 10/8/2009, Full Chilean, Proven. Carousel is friendly, crimpy and dense. She's adorable. Price $2500. Circus City Maya, Huacaya Female, DB, ARI 32838862, DOB 7/17/2015, 1/2 Chilean, 1/2 Peruvian, Unproven, Maya is a nice sized girl, very pleasant and looks quite elegant. She is bred to Circus City Maxim for a 2019 spring cria. Price $2000. Beretta, Huacaya Female, DRG, ARI 31186971, DOB 5/17/2008, Full Peruvian, Proven, Berretta is bred to Price $3500. Imperial Nadia, Huacaya Female, White, ARI 31627450,DOB 6/8/2010, Full Peruvian, Proven. Nadia is calm and pleasant to be around. She has very nice fiber. Microns 20.3, She is bred to Merlin for an early summer 2019 cria. Price $3500. EWW Sabrina, Huacaya Female, DB, ARI 30675155, DOB 6/22/2008,Full Peruvian, Proven. She handles nicely. She is by WD Steiner notable herdsire in the Midwest. She has a bay black female by Chaupi. Price $3000. Circus City Cedar, Huacaya Female, MB, ARI 31949170, DOB 7/25/2011, Proven. Cedar is friendly, tall and elegant. She has great fiber. Microns 26.2 Price $2500. Circus City Adele, Huacaya Female, DF, ARI 31949187, DOB 6/4/2013, Proven. Adele is a joy to behold. She has long staple length and good density. Microns 25.2 Price $2500. Circus City Onyx, Huacaya Female, TB, ARI 32748970, DOB 8/21/2012, Unproven, Onyx is beautiful black, great handle, good coverage and long staple length. Microns 20.8. 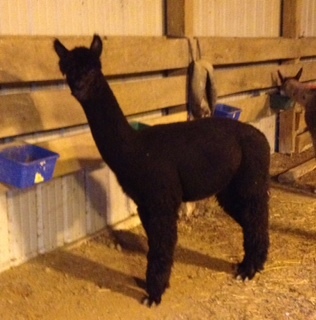 Onyx is bred to Merlin for late fall cria. Price $3000. Lady Cali of Excalibur, Huacaya Female, Wh, ARI 31019989, DOB 9/25/2007, Proven, Cali is very friendly, and is a great mom with lots of milk. Her fiber is very dense and crimpy. She has great coverage. Cali is bred to Chaupi for June 2018 cria. Cali has a gorgeous white male. Price $2500. Owned by Brad Hammersley. Hemingway-Accoyo Merry Christmas, Huacaya Female, Wh, ARI 32037364 DOB 12/25/2010. Unproven, Merry is a stout female with great conformation. Her fiber is dense and crimpy. She has great coverage and lots of fiber. She is bred to Merlin for fall cria 2018. Price $2500. Our Peruvian Belle, Huacaya Female, Wh, ARI 32206135, DOB 8/27/2012, Unproven. 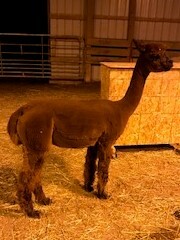 Belle is a standard size alpaca and she has great fiber and crimp. She is friendly and has dense fiber. Bell is bred to Circus City Quantum for fall 2019 cria. Price $2500. Sunday Parade, Huacaya Female, MB, ARI 30914650, 3/4 Chilean, Proven. Sunday is very friendly. She has good coverage, density and crimp. Circus City Lily, Huacaya Female, Appy White with Fawn Spots, ARI 31587273, DOB 9/3/2013, Proven 1/2 Chilean 1/2 Peruvian, Lily is very friendly. She has good coverage, density and crimp. She has17.7 micron fiber. She is bred to Maxim for spring 2019 cria. Price $2500. Circus City Patina, Huacaya female,ARI 31949224, Medium Fawn with mixed gray, DOB 6/17/2018 100% Peruvian, Unproven. Patina is a cutie. She's very curious; has a great disposition, and is very animated. She's growing nicely and her fiber is dense and has a great handle. Ask for price. 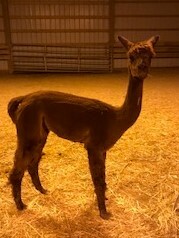 Owned by Brad Hammersley of Footloose Alpacas. Price $2000.